18/12/2007 — Acquisition — Paris, Fondation Custodia — The Fondation Custodia holds an important collection of autographed letters by artists (over 40,000) and consistently pursues its policy of acquisitions in this area. 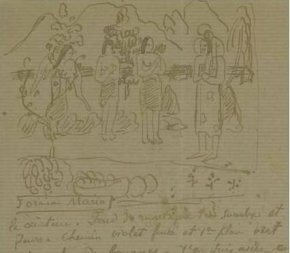 It has just acquired at Sotheby’s New York (last December 11th), during a sale of books and manuscripts, an important missive from Paul Gauguin (ill. 1) to Georges-Daniel de Monfreid, for the amount of $361,000 (including charges). Dated 11 March 1892, the letter contains a sketch (ill. 2) with several variations of la Orana Maria painted in Tahiti which today hangs in the Metropolitan Museum of New York. 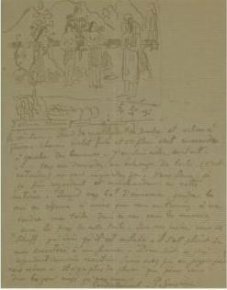 This is the fifth Gauguin letter to join the Frits Lugt collection which also owns the last letter that Monfreid sent to Gauguin. Having arrived after the death of the artist on 8 May 1903, it is stamped “deceased”. Another Gauguin headline in the news these last few days is the revelation by the Art Institute of Chicago that one of the works in their collection, The Faun (ill. 3), is in fact a modern forgery. 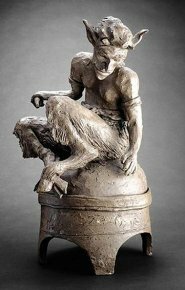 This ceramic sculpture was sold by Sotheby’s London in 1994, then acquired by the museum in 2001 from the London dealers Howie and Pillar for about $125,000. The object had been published several times and was considered a masterpiece. For more details of this amazing story see the article by Martin Bailey on the site of The Art Newspaper. Although changes in attributions are frequent in museums, such a mishap, discovering that a recent acquisition is really a fake, is usually rare.